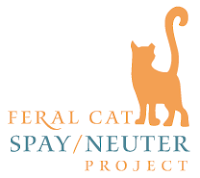 I recently met up with Lauren Glickman, Executive Director of the Feral Cat Spay/Neuter Project (FCSNP), a 501(c)3 non-profit, amazing spay/neuter clinic. She gave me a tour and told me how they do what they do. Before I started the tour, I dropped off a cat (The Duchess, you can read her story here) for her spay and then later was able to follow her progress through the clinic. There are many amazing things about FCSNP, where to start?! They provide free spay/neuter and rabies vaccination for feral cats who receive an eartip while the suggested donation for owned and adoptable cats (non-eartipped) is $25 for spay and $15 for neuter. 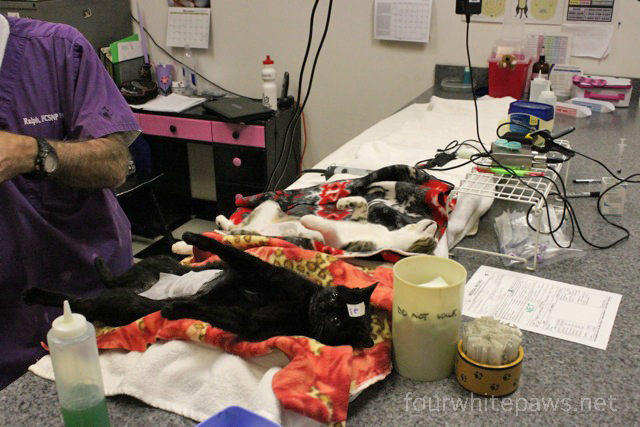 According to their website, they have altered 85,063 cats since they started in 1997 and 5,384 cats so far in 2013. Wow, that's a lot of cats! 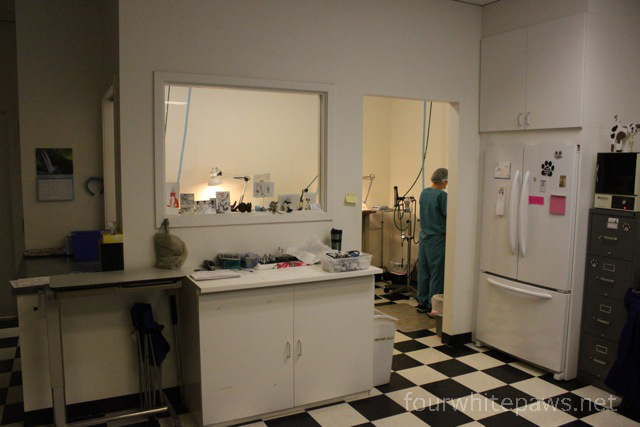 FCSNP is a National Mentoring Organization, which means they have all the information posted on their website for someone to replicate the clinic. Because they are committed to helping end domestic cat overpopulation, they want others to have all the tools they need to open a successful spay/neuter clinic, so they provide all their forms and every little detail of how they do what they do. I'll share with you the photos I took from the tour and rest easy, I won't be showing any blood and guts! They average around 50 cats per day, so they are setup to be very efficient. The anesthesia station, where the cat is sedated, examined and weighed. 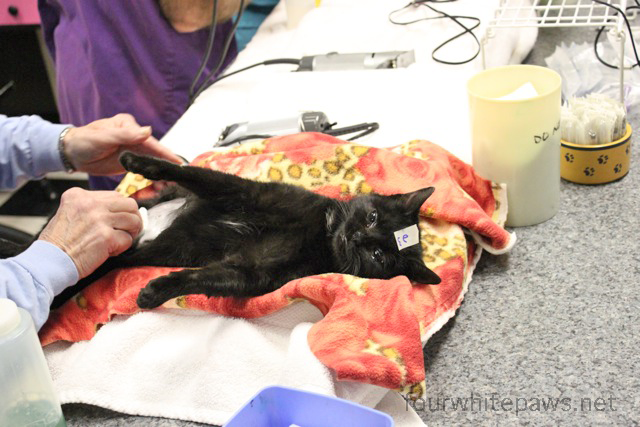 I learned that sedated cats don't blink their eyes, so an ointment is placed in their eyes to keep their eyes from drying up. scrubbed clean after it was shaved. 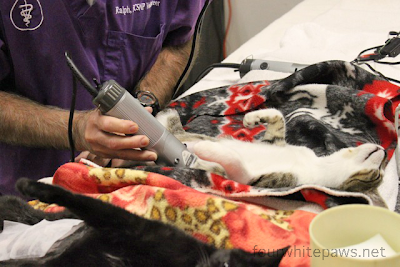 cats to recover as their sedation wears off. 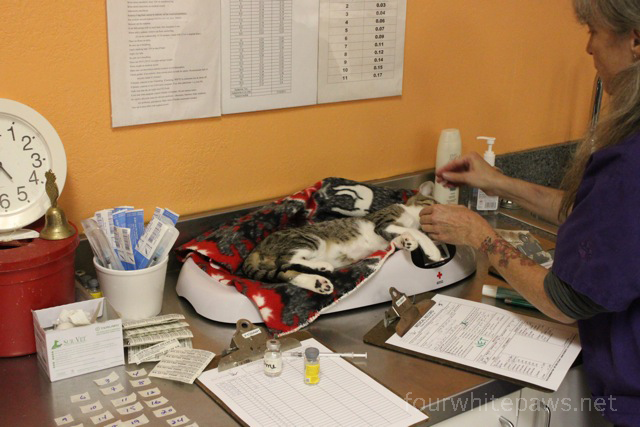 Each cat is given a number on their medical record. 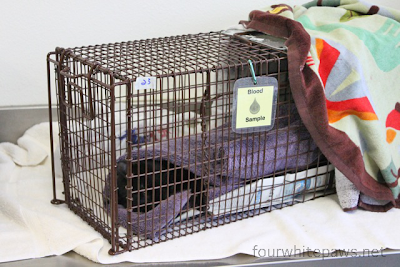 One copy of the number is stuck to the cat's head using medical tape and the other copy is attached to their carrier or trap. 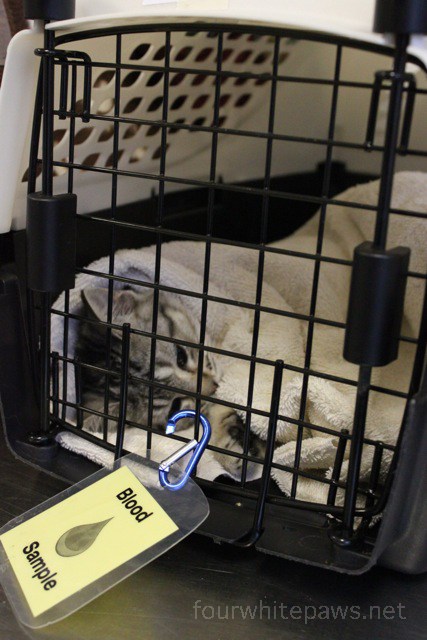 This allows for tracking of the cat during the process and ensures the correct cat is returned to the correct carrier or trap. The Duchess is sedated and on anesthesia gas, awaiting her surgery. 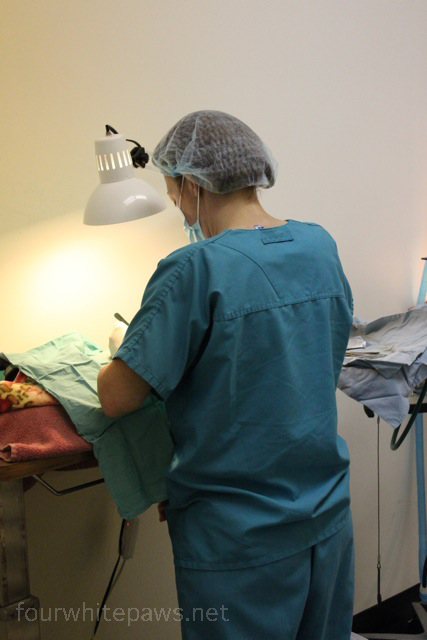 The vet is spaying a cat in the surgery suite, which is equipped with multiple tables. The Duchess getting her spay. 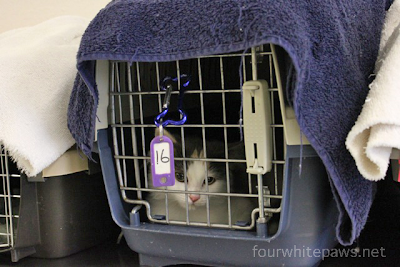 Once the surgery is complete, the cats are placed back in the carrier or trap they arrived in. Before they are put back in, the bedding is changed. The cats are wrapped up to stay warm and they are attended to frequently to make sure they are recovering without any problems. The "Blood Sample" tag indicates that the owner is has paid an extra $5 for a blood sample, most likely so the cat can be tested for FIV and FeLV. 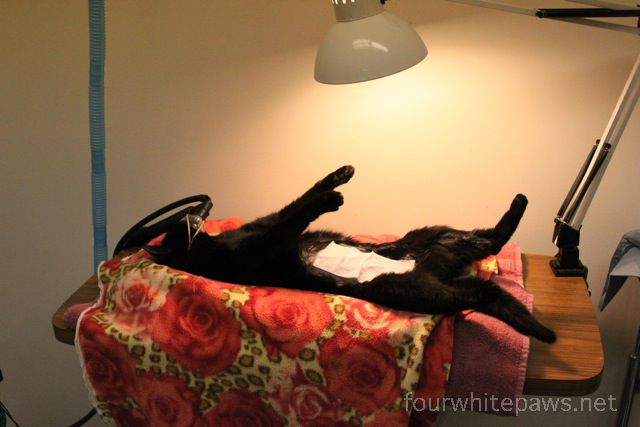 Still sedated, The Duchess is carried from the operating table back to her trap for post-op recovery. The Duchess, going back in her trap so she can wake up. 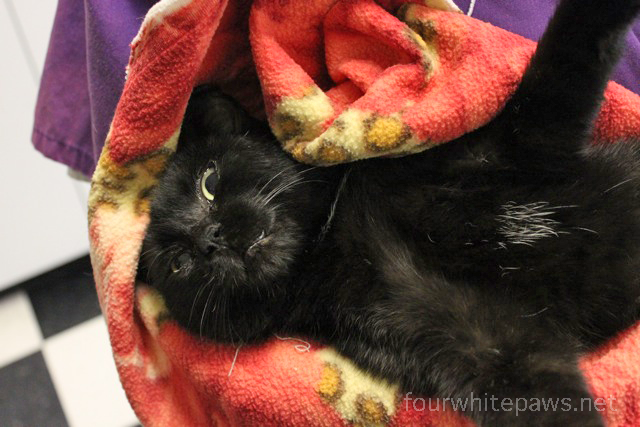 This beautiful kitty is waiting for surgery. FCSNP works all this amazingness with the help of over 60 volunteers and only 5 paid staff. I'm very grateful to have this amazing resource nearby. 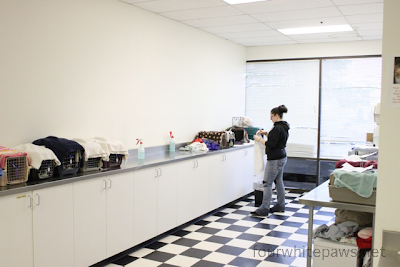 They are truly an awesome organization who is working hard to make a difference in the lives of the community cats. That was a fantastic post. Our own First Coast No More Homeless Pets works just like this, and they have nearly wiped out all of the Kill Shelters in our area. It is amazing the great work organizations such as these provide. This is such an amazing and fabulous thing that these folks do for cats! Thanks for sharing and being a part of this process. Amazingly efficient and so necessary. Wonderful work. I am amazed at it all. And I am far beyond grateful. I am grateful too for the post. What a smooth system - very efficient and yet the kitties are very well monitored. You do amazing work. This was very interesting and informative. They seem quite efficient.